Watching ITV on Apple TV with the ITV App. Home » Watching ITV on Apple TV with the ITV App. Update: Jan 2nd 2017: In a recent update ITV has blocked you from mirroring the output to the Apple TV. We can only imagine that they have some rights issues with various content owners that prevent them from allowing us to do this. We suggest you email ITV and let them know how hard they are making it for us to watch their programmes. It would also be worth complaining to Apple as they should be doing more with the UK based channels to get their content onto their platform. 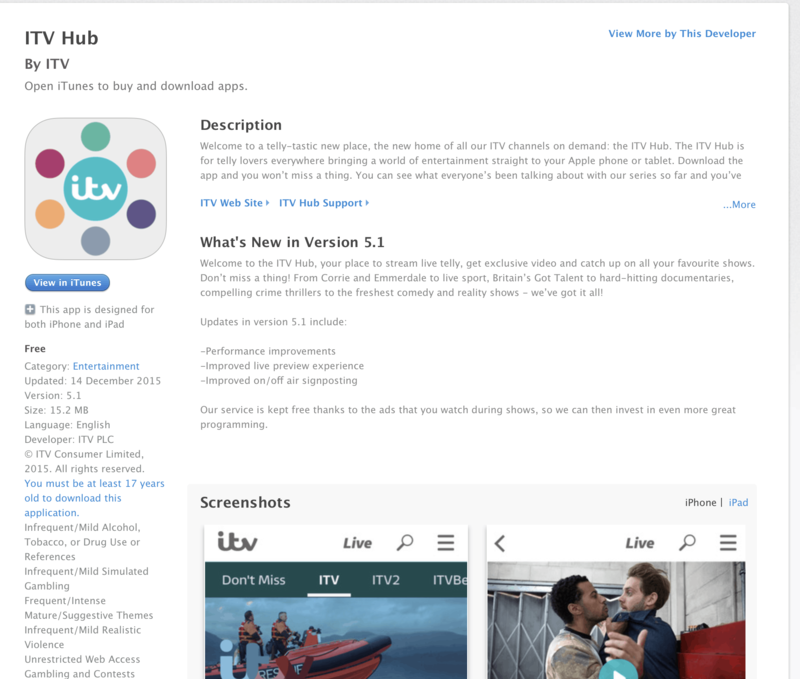 At the time of writing ITV have launched their new ITV Hub App on the iTunes store. This is the ITV equivalent of the BBC iPlayer. Currently, the ITV Hub App only works on iPhone and iPad and they haven’t released a version for the Apple TV. This shouldn’t be more than a few days development works for them so we hope they will get on and do it soon. In the meantime, you can use the ITV Hub App on your iPhone and mirror it onto your Apple TV. Except that you can’t. Mirroring is disabled.